Ambien is a legally prescribed, short-term prescription sleep aid. It is a benzodiazepine, and unfortunately, it can become an addictive, habit-forming substance. While Ambien is prescribed for short-term insomnia, users can form a dependence on the drug when they are unable to sleep. Ambien can cause side effects such as sleepwalking, leading to an increased risk of accidents. 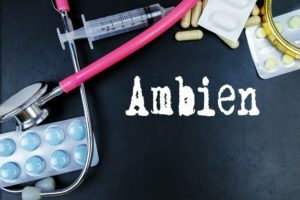 Usually, underlying conditions are the cause of a long-term Ambien habit, and inpatient treatment and counseling are effective measures in solving these problems. Do I need help with Ambien abuse? The definition of an addiction or drug dependence is when a user feels they cannot live or function without a substance, whether legal or not. Physiological reactions occur if the substance is stopped. When this happens, an addiction has formed. Why should I go to an inpatient treatment center? Usually, the reasons for a drug addiction of any kind are masking something much deeper in the patient. Inpatient treatment centers are designed to root out these causes. Medically trained staff are available to monitor and support those who are undergoing recovery. Sometimes, dangerous withdrawal side-effects can occur when recovering from substance abuse, and a user is much safer and more likely to make a full recovery if they detox in an environment designed for such things. What does a sample program schedule look like? Windward Way’s rehabilitation center is unique in that it offers tailor-made treatment programs specific to the individual. Windward Way takes a holistic approach to treatment, taking into account the individual’s specific needs and their medical history. Detoxification is usually the first step, followed by an inpatient rehabilitation, individual, group, and possibly family counseling, and then outpatient and follow-up care. Daily activities are structured and undertaken in a supportive environment, supervised by trained and caring medical staff. How is group therapy used in inpatient care? The downward spiral into addiction is a perilous, dangerous journey, and usually, the circumstances and belief structures that have led the individual down that path must be addressed before recovery can happen. The road to recovery is long and hard, and making the journey alone can seem daunting and overwhelming. Participating in tailor-made, supportive group therapy sessions can ease this burden. At Windward Way, group therapy is considered an essential weapon in the recovering addict’s arsenal. Group therapy sessions are carefully monitored and only consist of individuals who fit the group’s specific profile. A counselor will meet with all the members before the start of the group session, so they can be assured that it is the right place for them. Every member is a voluntary participant in the session. Participants are encouraged to share their feelings and experiences and to learn positive coping mechanisms for stressful events. Sessions usually occur once a week and may last up to a few hours. How can I avoid relapse after treatment? Long-term maintenance is required of those wishing to remain substance-free for life. This includes things like changing their environment. Remaining in the same stressful or negative and familiar environment that lead to addiction in the first place is best avoided. Continuing with doctor and counselor recommended treatment plans will also help the individual to remain sober. Developing positive coping mechanisms to stressful events is a prime way to avoid a drug relapse. This is one of the reasons why Windward Way stresses the importance of undertaking therapy sessions and developing a holistic treatment plan for the recovering individual. Reaching out for support will also help the individual to avoid a relapse after treatment. Windward Way offers advice and encouragement for family members and loved ones of those in recovery. Creating a stress-free environment, remaining positive and supportive, and understanding the recovering individual’s triggers can help them avoid a relapse. Those in recovery are also encouraged to bring a supportive family member to therapy sessions. Going to rehabilitation for Ambien addiction or an addiction to any substance, legal or not, will uncover the underlying, deep-seated reasons for the addiction. Uncovering these reasons in a supportive inpatient treatment center gives the individual a safe place to recover, and maintain a holistic, tailor-made approach to avoiding relapse. Ambien® (Zolpidem) is a drug similar to benzodiazepines such as Xanax or Valium and often prescribed as a short-term sleep aid. Unfortunately, it has also become a frequently abused drug with serious consequences for its misuse. At Windward Way, we realize how frightening these things can be for family or for those who have gone through it. A rehab for Ambien at Windward Way can help bring a sense of balance back to your life without the need for addictive drugs. You can find the answers you’re seeking now: 855-491-7694. Through both our prescription rehab and also our addiction treatment program, we aspire to give hope and direction, not only for the clients we help, but also for the families affected by their loved one’s addiction. Since withdrawal from heavy Ambien use can occur, our highly trained intake staff will determine whether an Ambien detox is appropriate as a first step to discover the true freedom that only a life in recovery can bring. Throughout every step of our admissions process you’ll be happy to discover that we bring no judgment whatsoever, but only accurate, up-to-date information to rediscover the life you seem to have lost. Call us now. 855-491-7694.